Fortune Small Business is a popular, high-circulation nationwide business magazine published by Fortune and owned by CNN. The September 15, 2008 issue of FSB not only included a profile on 24-year-old Jason Yeh, part of a feature on disability entrepreneurship in the technological sector, but put him on its cover. (David Yellen’s striking photograph of Yeh with the VPAD, used for the FSB cover, is below.) The honor came as a complete surprise to Yeh, who knew that FSB was doing a writeup, but not that he had been chosen for the cover. It also comes on the heels of another honor for his company: his father John, founder and CEO of Viable, was recognized as “25 CEOs You Need to Know” by the Gazette of Politics and Business, a respected weekly Maryland-wide publication owned by the Washington Post Company. In its 2008 list of “Exceptional 53 Businesses,” Viable came in second—between Honest Tea (first-place winner) and Discovery Communications (third place)—both of which are well-known, nationally-marketed brands. 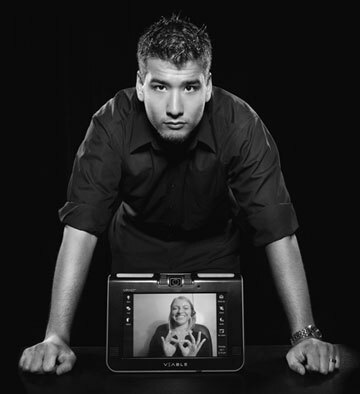 The VPAD was developed by Yeh and his friend from his Gallaudet University days, Larwan Berke. It was unveiled at the CES Unveiled technology-trade show in Las Vegas last January. It's been a busy year for Viable and its team, and 2008 has undoubtedly been the most exciting year of Yeh’s life. He says, “Many thought that Viable would have it easier after launching the VPAD, but actually we’ve been busier than ever—we’ve coordinated an ambitiously large beta-tester program, revamped our customer support department so we could better educate and serve our customers, and set our engineers on redesigning a new version that incorporated feedback from our customers. “The biggest change for me, however, has been my marriage to a lovely lady, Raymonda Azrelyant. She works at NASA’s Goddard Space Center as an accountant. We wed in late May 2008 and I am grateful to for her support. I spend approximately 60-70 hours working every week, and often am at my laptop because I have relationships on both the East and West Coasts and in other countries. Most people wake up to coffee or breakfast; I wake up to my laptop and E-mail account. There is no way I could accomplish as much as I have without my wife and marrying her has been my most exciting milestone in 2008. Congratulations to Jason Yeh, John Yeh, and the Viable team!